This is my great grandfather’s WW1 draft registration card. This document was apparently filled out on 7 Sep 1918. 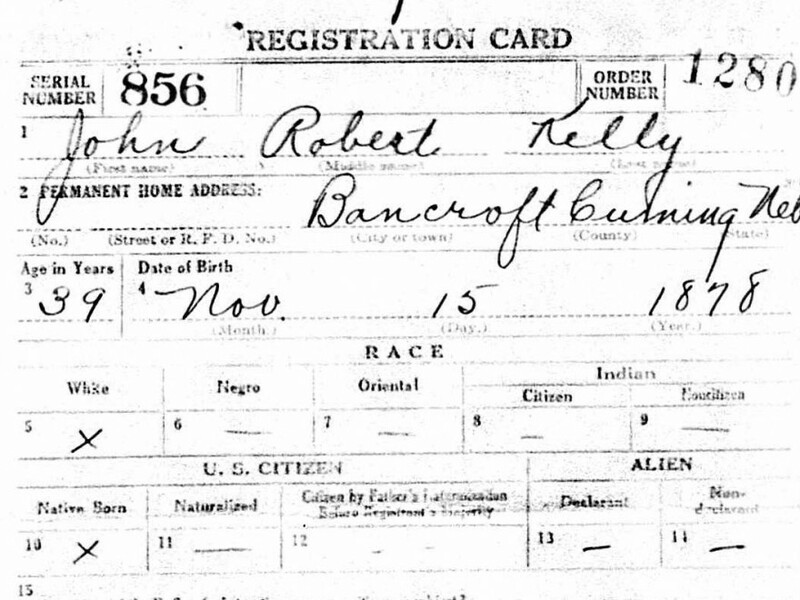 His name is listed as John Robert Kelly. His date of birth is listed to be 15 Nov 1878. His age at the time of registration was 39 years. He claims that he was working for himself in Real Estate in Bancroft, Cuming, Nebraska. His nearest relative is listed to be Michael Kelly in Bancroft, Nebraska. He was identified as being of medium height and medium build,with blue eyes and brown hair. The original source documents were obtained through Ancestry.com and are provided below (please see detailed citation information at bottom of page).